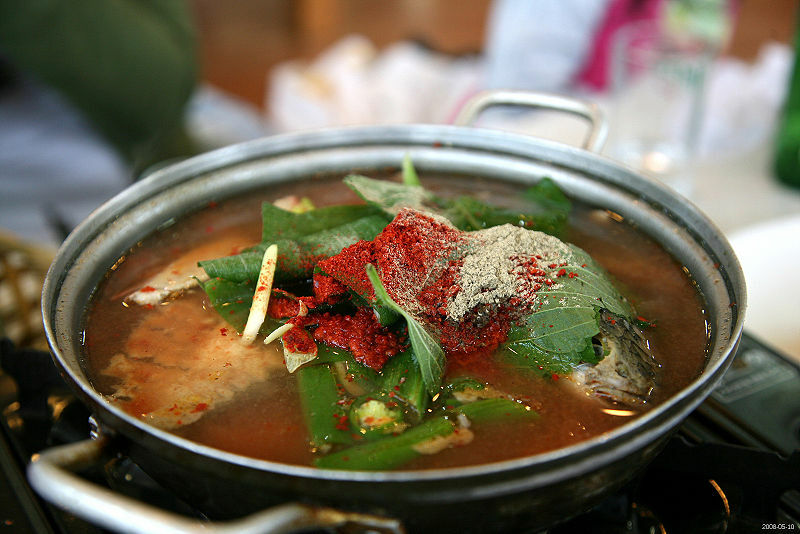 Mae-un tang is a hot spicy Korean cuisine fish soup boiled with gochujang (Korean red chili pepper paste), kochukaru (chili powder), and various vegetables. The name is a combination of two words: maeun, meaning "hot and spicy"; and tang, meaning "soup." As its main ingredient, fresh or saltwater fish is cut into several pieces and boiled with ground beef, green vegetables such as watercress and garland chrysanthemum. Onion, radish, chilis, crown daisy, garlic, and sometimes zucchini and bean curd are added to the mixture to absorb the chili pepper paste which is the main flavoring of this dish. It is then seasoned with chili powder, garlic, soy sauce, and additional gochujang may be added once more to meet everyone's taste buds. Restaurants that offer this dish often allow customers to select their fish from an aquarium. Many specialty seafood restaurants have several aquariums from which to choose. Popular fish for this dish may include red snapper, sea bass, yellow corvina, codfish, croaker, pollack, and even freshwater fish like carp and trout. In addition, other shellfish such as crabs, clams, and oysters can be also added to this soup to complement and enhance its spicy yet refreshing flavors. This soup is one of Korea's most popular dishes while drinking soju. If ordered with hoe at a restaurant, the soup is often then made from the leftover parts of the fish. Add kochujang, kochukaru and soy sauce. Bring to a boil. This soup is one of Korean's most popular dishes while drinking soju.